How to create a Lesson using the Text with Video Component? 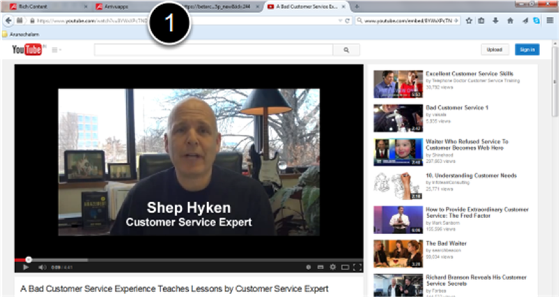 You can have a page with some text on one side and a YouTube video on the other side of the screen. You can add a thumbnail for the video too. You can use this component whenever you want to explain something with a video that is available on YouTube. The pages created with this component are static, except for that you can click the video thumbnail to play the video. When you click on the video thumbnail, the video starts playing. Each page may contain only one title, one video and lot of description text. The video will be stopped when you move to the next slide in the same Presentation. If you go back to the slide where the slide is, then the video will start playing from the beginning automatically. You can upload your own thumbnail preview for your video. You can swap the sides of the video and text just by clicking a checkbox. 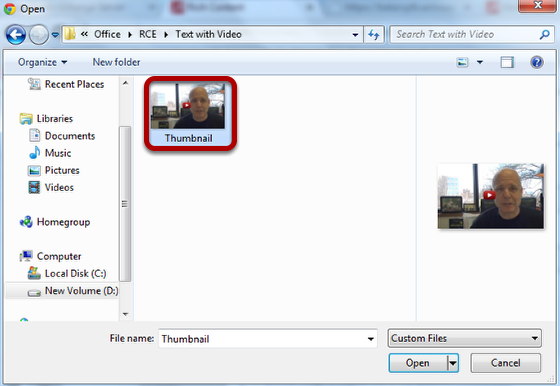 Then click on the Text with Video component icon as shown in the above image. You will see a screen similar to the image shown below. Add video Url by typing or pasting it in the Video Url  field. Add an image related to the contents of the page by clicking on the '+' button below the Thumbnail Image  field. Swap the image to the left side by clicking on the Swap video to left  checkbox. Save the changes you’ve just made by clicking the Done  button. Remove the component from the slide by clicking the Remove  button. 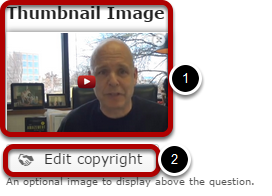 Type or paste the embed URL of the video on the Video Url field as shown in the above image. You can add a thumbnail image to the page by clicking the '+' icon as shown in the above image. You will see the below screen which will prompt you to choose an image file. Select the folder from the above screen and select the image that you want to add to the page. You can see the image being uploaded under the Thumbnail Image title shown in the below image. Once the image has been uploaded, you can see its preview under the Thumbnail Image title as shown  in the below image. You can also update the copyright details of the image by clicking on the Edit copyright  button shown above. Once you click this button you will see the below screen. By default, the video appears on the right side of the screen. 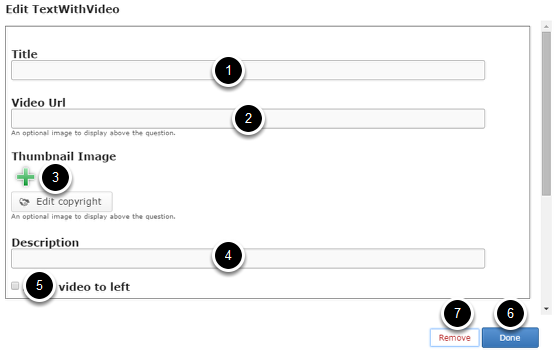 If you want it to appear on the left side, just check the Swap video to left checkbox shown above. 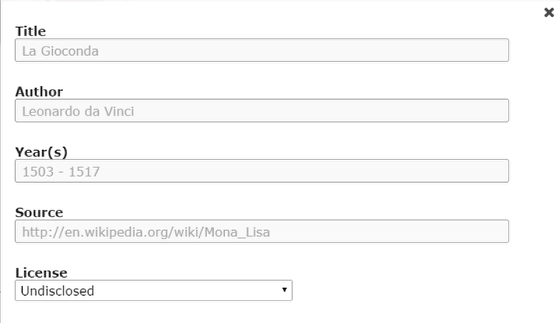 In this example, the checkbox is left unchecked. 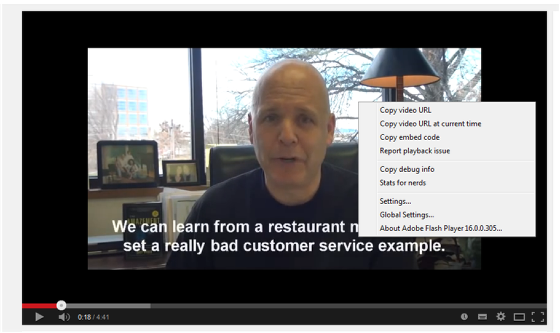 Right click on the video, so that a context menu will appear. 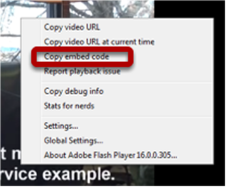 Select Copy embed code option from the menu as shown in the above picture. Even if you swap the video to the left side, the title will remain on the left side only. You won't be able to swap the side of the title. Please make sure that the video is available to be used in your page, because some videos can’t be embedded due to privacy and copyright reasons.